This garden is located in the middle of Cihanjuang street, where we can only find a small sign and a gate. Don't worry, just enter the gate and once you pay the parking fee you will find huge parking lot. We even can see many butterflies at the parking lot! 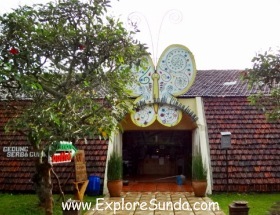 Then we enter the next gate, where we will find a cafe and a butterfly shop. 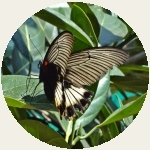 The shop sells many things related to butterflies, sometimes we can find good, rare book about butterfly here. They even sell colorful butterfly wings made of stockings for girls. We buy entrance ticket at the cashier of this shop. 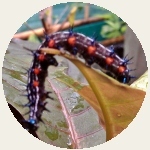 The ticket is valid for two places: the butterfly garden and caterpillar nursery. The entrance to the garden is on the left of the cashier, but the nursery is located in the parking lot. There is a pile of colorful hats we can borrow when roaming in the garden. Sometimes butterflies will perch on the hat, or our clothes, if we wear something bright, such as red. Butterflies are day creatures. 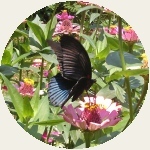 Therefore, the best time to visit a butterfly garden is in the morning, when the butterflies are active. Many butterflies welcome us when we visit them on one sunny Saturday morning. They are busy flying from one flower to another, in search of nectar, their main food. Sometimes we also can see mating butterflies. 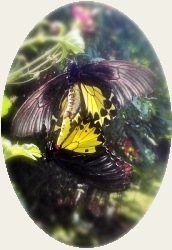 I was surprised to know the female butterfly can fly carrying its partner while mating! 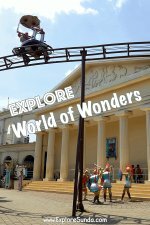 Are you interested to know more about butterfly? Let's go to the pavilion in this garden, where we will find several frames of preserved butterflies. 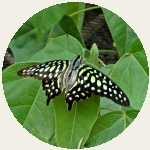 We can learn the name and characteristics of each butterfly. 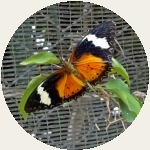 I just found out that male and female butterflies have different wings pattern. 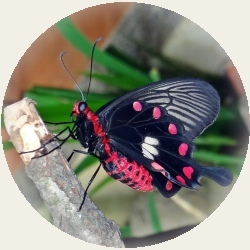 For example, there are 4 wings patterns for a Papilio Memnon: 1 wings pattern for male and 3 wing patterns for females. 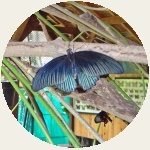 This pavilion also has information about the metamorphosis of a butterfly, from an egg to larva, pupae, chrysalis and finally becomes a beautiful butterfly! We will find a big cage in this pavilion. Inside there are hundreds of chrysalis arranged neatly. 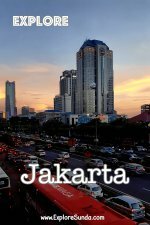 They are from all over Indonesia. Look at them closely, and you will find some butterflies slowly emerge from its chrysalis. Butterflies need a couple hours to dry their wings before they can fly. Thus, sometimes the staff will let you touch them gently or put them on your hand. Just be careful, they are so fragile and once their wings are broken, they will never be able to fly and eventually die. Butterflies are active in the morning, so you'd better come early. Caterpillar Nursery, that's how I called it. This is not the formal name of this place, but it refers to the function of this green house. It is divided into 2 sections: the first one is the nursery for the plants. The leaves of these plants will be the main food for caterpillars, hence, they are not flowers. 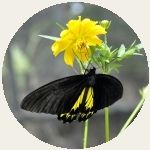 These host plants are critical in breeding butterflies, since a female butterfly will never lay eggs if she can't find suitable plants for her baby caterpillars. The next section is the caterpillar nursery. 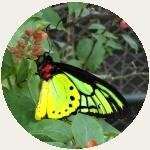 It contains mating butterflies, host plants, and flowers for the butterflies. The staff collects the eggs everyday and put them in the storing cabinet. Once the eggs hatch, the caterpillars will be put on the suitable leaves. From now on they will be munching and munching and munching.. until they are big enough to change their skins and finally become a chrysalis. If we look closely, we will find many caterpillars in this nursery. 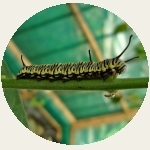 At the end of this nursery there is a special place called touching area, where we are allowed to touch the caterpillars! 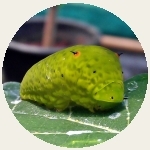 I saw a green caterpillar that looks like a gel, stripe caterpillars with lots of horns along its body, and white fat caterpillars that will become an Attacus Atlas. 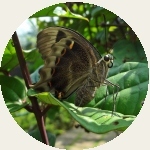 Actually, Cihanjuang Butterfly Garden only breeds butterflies, the only exception is the Attacus Atlas. It is known as one of the largest butterflies in the world, but in reality it is a moth! It has big beautiful wings, approximately 25-30 cm. Unfortunately it only lives for 5 days, since it doesn't have any mouth to eat. So, it only lives to mate and lay eggs. 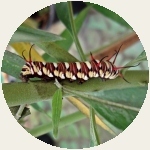 On the other hand, a caterpillar of Attacus Atlas eats 200 leaves during its 2-weeks lifetime! Address: Cihanjuang Street no. 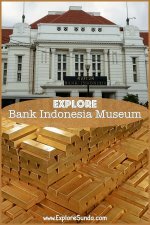 58, Cibaligo, Parongpong, Cimahi. Cihanjuang street is the street that connected Bandung to Lembang via Cimahi. 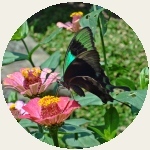 Hence, we can go to Cihanjuang Butterfly Garden from Bandung or Lembang. However, I prefer to go from Bandung to Cimahi then go up north, since the garden is closer to Cimahi than to Lembang.